More than 500 years ago, Leonardo da Vinci created the first resume ever. Fast forward to 2019, and many of us still use the CV as the primary instrument to make hiring decisions. That seems a little weird, doesn’t it? Especially considering how much innovation we’ve seen over the last five centuries in all areas of life and work – including in HR. To stand out and win the war for talent, companies need to be on top of their game. In other words: asking candidates to upload their resume at the start of your application process isn’t going to cut it – nor impress them. 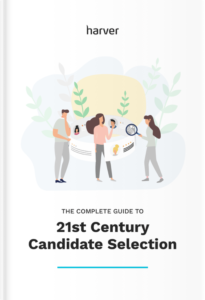 Therefore the time to modernize your candidate selection process is now and in this guide, we will show you how. In this guide, we’ll take a closer look at 21st-century candidate selection. We’ll start with the most common pitfalls of selecting candidates. Then we’ll discuss the three pillars a modern-day selection process should be built on. And finally, we’ll talk about how you can improve each of these pillars. In many companies, big or small, the hiring process is outdated on more than one front. The impact of technology on the way people work, the rapidly growing gig economy, and more generally speaking, the changing expectations of (younger) job seekers are just a few reasons why the way organizations are hiring doesn’t reflect the dynamic nature of the contemporary job market. A messy selection process is bad for both recruiters and candidates. 56% of candidates even say that a poor recruitment experience leaves them with a negative view of the brand. On top of that, an unstructured process isn’t scalable nor easily repeatable and puts a strain on your recruitment department as well. Every job family requires a unique combination of skills, competencies and personality traits in order for someone to be fully productive. Therefore it makes no sense to use the same hiring process for all roles, especially since 55% of HR managers say ‘loss of productivity’ is the biggest problem associated with bad hires. A one-size-fits-all selection process increasingly leads to an inefficient selection process and subsequently, bad hires. Are you still posting your vacancies on job boards, plowing through stacks of resumes and scheduling interviews manually? Nowadays, many tedious, time-consuming tasks can be handled by technology saving you precious time in the process. And this doesn’t just make your life easier, candidates will love you for it as well. Did you know that 57% of job seekers lose interest in a job if the hiring process is too long? Too often still, recruiters make hiring decisions based on gut feeling rather than data. Not only does this create a big risk of hiring the wrong candidates, but it also makes it easier for bias to creep into the process. Not surprisingly, 74% of employers admit they’ve hired the wrong person for a role somewhere in their recruiting efforts. That can happen if you collect irrelevant data about your candidates’ skills. Learn how to test the skills of the applicants in a reliable way. When you’re under pressure to find that perfect candidate sooner rather than later, it’s easy to forget about the candidate experience. Often heard criticism from applicants includes a lack of feedback about their application or how they did in the assessment. Furthermore, 61% of employees say the realities of their new job differ from expectations set during the interview process. We all know today’s labor market is largely candidate-driven. Unemployment is relatively low, many top candidates are so-called ‘passive candidates’ and employees want to work for a purpose-driven company that supports their professional and personal growth. A quick, smooth and structured selection process serves both you and your candidates. After all, improving efficiency directly impacts time to hire, cost per hire and candidate satisfaction among other metrics. Whether it’s through a resume, interview or validated assessments, having the right data is essential in the candidate selection process. Needless to say, keeping the Candidate Experience in mind throughout the process is of utmost importance as well. After all, when people apply, they are brand enthusiasts one step away from becoming either brand advocates – or adversaries. It’s the candidate experience that makes the difference here. You need to blend all three ‘ingredients’ to get the best results from your candidate selection. If you focus on efficiency and data only, your candidate experience might suffer. If data and candidate experience are your mains areas of focus, you might find out you’re losing qualified candidates because your hiring process is too lengthy. Concentrating on efficiency and candidate experience might mean you’re not collecting enough data (or the right data) and therefore, not making data-driven decisions, possibly leading to wrong hires. Download this article as an e-book, print it out, send it to your colleagues and share the insights! Knowing why each of these pillars matter is one thing, knowing how to improve them is another. Candidates can originate from a wide variety of channels. From job boards and social media to your company’s career page, walk-ins (a common thing in retail) and referrals. To keep things organized, be sure that you consolidate your sources. Meaning, make sure you send candidates to, for example, a landing page that serves as an entry point for the next steps in your selection process. Also, make sure you track your sources correctly. This will help you optimize your budgets later on. With candidates coming from so many sources, it is easy to lose track of who came from where. By consolidating your sources, you’re ensuring no candidate will slip through the cracks. Keeping track of all your candidates and keeping them informed at all times is a very time-consuming, if not impossible, task. In order to avoid disappointment on the applicant’s side, you want to automate this part of the hiring process. Doing so will keep your candidates happy and engaged because they get automatic updates about the status of their application. Luckily, most recruitment and HR Tech solutions nowadays have automatic email scheduling capabilities. Sending your candidates automatic updates is great. Giving them full online accessibility to the status of their application process is even better. It enables them to check where they’re at anytime they want without having to ask for it. The same thing goes for recruiters. 100% online accessibility makes it super easy for you to see which candidate is at what stage of the hiring process and what needs to be done next. In candidate selection, flexibility is the magic element that many organizations do not fully leverage yet. Based on the results you get from your selection process, you’ll want to tweak some parts of it and leave others untouched. Your selection process should be an ever-evolving entity which is why you want to build it in such a way that allows you to easily adapt it to changing circumstances. Resume screening, interview scheduling, sending confirmations and status updates, answering basic candidate questions, etc. The list of easily automatable tasks that are part of the selection process is anything but short. Take a good look at your current process and automate those tasks that take up a big chunk of your time. Using tools and technology to make your life easier – and your hiring process better – is awesome. Just keep in mind that every new piece of tech you add needs to integrate with your other tools. Because if they don’t, it would only create extra issues and that would be bad for your overall efficiency. Modern-day recruitment departments are moving towards a reality where they own a complete ‘tech stack’ to cover all their needs. Integration capabilities across tools are essential here. Recruitment funnel is complex and involves not only multiple people but also using diverse tools in its various stages. It is crucial that these tools work well together to build an efficient recruitment process. Data is key to making the right hiring decision. We all use a resume and cover letter to gather information about applicants, which is okay-ish. However, a resume only says so much about a candidate. And even then, everybody looks good on paper. So if there’s one thing to remember about data, it’s that it needs to be valid. Scientifically validated preferably. So, how to go about collecting this data? Well, there are heaps of ways, some better than others. Think of social media scraping or keyword analysis in resumes for example. If you want to get reliable results though, you need reliable input. There’s a saying in data science: ‘Garbage in, garbage out.’ Meaning, if you use garbage data, you’re going to get a garbage result. So you need to provide yourself (or the decision maker) with validated data. And the best way to do that is via scientifically validated assessments. These assessments are tried and tested continuously and are the most effective in getting valid data for making hiring decisions. Assessing the level at which a candidate learns, solves problems and understands instructions – also referred to as Cognitive Ability or General Mental Ability (GMA) – is a high predictor of success across a large pool of job families. After all, the matter in which a candidate shows cognitive ability and problem-solving ability directly relates to on-the-job performance in many cases. There are various ways to assess cognitive and problem-solving abilities, but the trick here is to try and make it fun (candidate experience, remember?). One way to do this is by creating a mixture of gamified assessments that challenge the cognitive abilities of a candidate in an engaging way. Think puzzles, codebreakers or pathfinding games. Personality is something you should cover in any candidate selection process. After all, it is essential for on the job success. The problem is that it’s also one of the hardest things to measure. Because there are so many factors that determine one’s personality that not all of them are fit for candidate selection. Luckily, there is a general consensus in the academic world that some personality questionnaires do provide valid data when it comes to candidate selection; the Big 5 personality questionnaire and derivatives of this framework like HEXACO, TIPI and others ,for example. Why are these considered valid and others less so? Because they rank someone’s personality on a scale instead of putting people in boxes. Personality questionnaires are tricky in terms of validity. Be sure to look for a questionnaire that works with a scale instead of types/colors/domains such as the HEXACO personality questionnaire like Netflix did. Although in many organizations culture fit is used as an umbrella term for a candidate’s soft skills, there are actually scientifically validated ways to measure culture fit as well. The Organizational Culture Assessment Instrument (OCAI), for instance, uncovers a candidate’s cultural tastes across six key dimensions of organizational culture through a questionnaire and compares it to the situation at your organization. Not to say that your typical culture questions don’t have their place in the selection process. They do. But if you really want to assess culture fit in a validated way, try combining your culture questions with an instrument like the OCAI. Situational Judgement tests are all the rage nowadays, and for a good reason. First off, an SJT provides candidates with an idea of what they can expect from the job and is part of the overall Realistic Job Preview you should provide in a future proof candidate selection process. Second, if constructed properly – an SJT is an indicator of job performance and culture fit. Unfortunately, the thing with SJTs is that they’re difficult to construct (if you want to do it from scratch yourself, that is). For your generic SJT, you need an IO-Psychologist, a designer and a developer, plus a budget to get them all to work. But if you’re in the high volume hiring game, or heavily rely on culture fit, they’re definitely worth the trouble. Besides culture fit, personality and cognitive ability, you want to know if someone possesses the right skills for the job. Although there are ways to measure generic skills like typing, multitasking, language proficiency etc., in the end, it depends on the job family and/or role you’re hiring for. After all, the skills you assess should be connected to the job. Every job family requires different skills assessment. But some skills such as multitasking, typing, language proficiency etc. are useful across many different job families. Realistic job previews are a great way to give your candidates an honest look inside your organization. A ‘behind the scenes’ kind of video showing both the good and the bad, in combination with an SJT can truly give applicants a sense of what it is like to work in your company. It also offers them a taste of the organizational culture and, of course, the job they might end up doing. Giving a realistic job preview is one of those things that should always rank high on the effort vs. impact list. Global hospitality leader HMSHost restructured their candidate selection process with an emphasis on providing an RJP. As a result, employee turnover decreased by 38%. Realistic job previews have a positive effect on your candidates. If they don’t like what they see, they will de-select themselves from the recruitment process. There’s nothing worse for a candidate when, after they’ve put their heart and soul (and precious time) into an application process they don’t hear back from you. Feedback should be a key part of any modern candidate selection process. Let your candidates know how they did. Regardless of what stage of the selection process they made it to. Did they go through an online assessment? Share their assessment results with them so they know their strengths and weaknesses and can use this to improve next time around. 21st-century candidates are always switched on. Waiting for a company to come back to them regarding a simple question is the last thing they want to be doing. Best case scenario: they’ll think your candidate experience was so-so. Worst case scenario: they’ll move on to one of your competitors. In other words: make sure you communicate in a timely (perhaps automated) manner and keep your candidates engaged throughout the entire selection process. The bar for today’s ‘standard’ user experience is pretty high. Think of applications such as Uber, Snapchat, and Netflix. Candidates are used to these kinds of super smooth, intuitive user experiences. And they expect nothing less from their work environment. As soon as a candidate applies for a job in your organization, they get a taste of your company’s tech status, so to speak. If you want to stand a chance in attracting the top talent of tomorrow, you better make sure you’ve got a top-notch UX. This goes hand in hand with an intuitive UX. Today’s job seekers, especially Generation Z and beyond, manage every aspect of their lives with their smartphones. A mobile, multi-device proof application process is not a nice-to-have, it’s a must-have when you want to build a modern selection process. …so if you’re still wondering why you should care about mobile friendliness, stop now. While Leonardo da Vinci was a man with great ideas, it’s time to move on from using the CV as the primary instrument to make hiring decisions. If you want to stand a chance in today’s candidate-driven job market, you need to innovate your selection process. A 21st century recruitment process should be based on three pillars: efficiency, data and candidate experience. If you optimize each pillar – and keep doing so based on the results you get – you’ll be able to build an agile selection process that helps you attract and select top candidates. Efficiency-wise, streamline your multi-sourced candidate flow, automate messaging and the automate manual tasks. In terms of data, the most important thing to keep in mind is to use valid data. to check that vendor uses scientifically validated assessments. On a candidate experience level, the key ingredients are instant communication, a smooth UX, feedback, and the management of expectations about the job and the company. Modernizing your candidate selection process isn’t something that has to happen overnight. Start by making certain parts of your hiring process more efficient for example and, depending on the results you get, take it from there.